Bus transfer from Kilkenny to Newmarket and arrival in St. Brendan's N.S. Newmarket. They show us how to play "The Hurling". 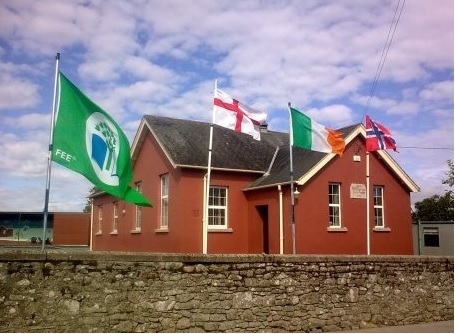 (Irish: Iománaíocht/Iomáint) is an outdoor team game of ancient Gaelic origin,a dministered by the Gaelic Athletic Association, The game has prehistoric origins, has been played for over 3,000 years, and it is thought to be the world's fastest field team game in terms of game play. One of the Ireland's native Gaelic games, it shares a number of features with Gaelic football, such a field and goals, number of players, and much terminology. There is a similar game for women called camogie. It shares a common Gaelic root with the sport of shinty (camanachd) which is played pedominantly in Scotland. The object of the game is for players to use a wooden stick called a hurley (in Irish a camán) to hit a small ball called a sliotar between the opponents' goalposts either over the crossbar for one point, or under the crossbar into a net guarded by a goalkeeper for one goal, which is equivalent to three points. The sliotar can be caught in the hand and carried for not more than four steps, struck in the air, or struck on the ground with the hurley. It can be kicked or slapped with an open hand (the hand pass) for short-range passing. A player who wants to carry the ball for more than four steps has to bounce or balance the sliotar on the end of the stick and the ball can only be handled twice while in his possession. Baiting is allowed although body-checking or shoulder-charging is illegal. No protective padding is worn by players. A plastic protective helmet with faceguard is mandatory for all age groups, including senior level, as of 2010. The game has been described as "a bastion of humility", with player names absent from jerseys and a player's number decided by his position on the field. Then we visit Dunmore Caves, Co. Kilkenny. Dunmore Cave is eleven kilometres north of Kilkenny City and, like other caves across the country, is formed by limestone which was laid down over 300 million years ago. It contains almost a quarter of a mile of passages and at its deepest point is 150 foot below the surface. Although this is smaller than many of the caves around the country, the beauty and magic of its calcite formations as well as its scientific and historical interest make it one of Ireland's most fascinating caves. Its presence has been known for years but it is only recently that attempts have been made to unravel its history. In 928, the Dunmore Cave was the site of a Viking massacre. Mention of the cave was made in the 9th century Irish Triads. Since 1940, when the cave became property of the State, it has been a National Monument because of its historic interest. Today, stairs and walkways and an extensive lighting system have been installed to aid access and viewing. There is restricted plant and animal life in and around the cave primarily due to the lack of sunlight. 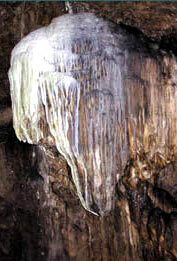 The cave did at one time support a bat colony and bat skeletons can be seen encrusted in the calcite limestone. History and geology blend at Dunmore Cave to give an interesting and unique situation. Consisting of a series of chambers formed over millions of years, the cave contains some of the finest calcite formations found in any Irish cave. Exhibitions and displays in the Visitor Centre. The cave is inaccessible for wheelchair users. At about 12:30 we arrive in Castlecomer Discovery Park and we have lunch and tree top walk activities (optional for teachers). In the afternoon we go to a reception in City Hall Kilkenny from Mayor of Kilkenny.